Barlow Books had a stellar year for bestselling books in 2017. Our books made it onto several bestselling lists, from amazon to the prestigious Globe and Mail bestseller list. Breakdown: The Inside Story of the Rise and Fall of Heenan Blaikie was a big winner in 2017. Author Norman Bacal made it onto the Globe and Mail bestseller list, and his book has been a long-term resident on the amazon bestseller list in his categories. At one point, it was one of the top 20 books sold in Canada on amazon. A Woman’s Guide to Healthy Aging, by Dr. Vivien Brown, hit Number One in women’s health on amazon after publication of a Globe and Mail story about Brown and her book. Impressively, it hit Number 120 of all books sold on amazon in Canada. Brown’s helpful guide has been distributed to bookstores and retailers in large numbers, and it will go on sale at Shoppers Drug Mart at the beginning of February — a great way to fuel more sales. 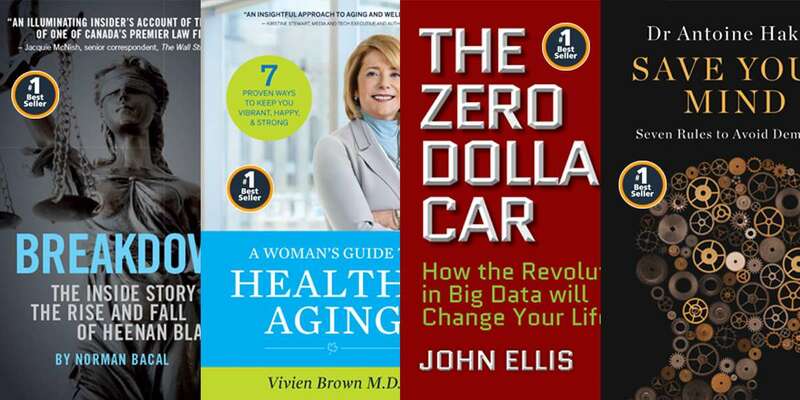 The Zero Dollar Car, by U.S. technology expert and speaker John Ellis, reached Number One in his category, and it was on the top-1000 list of all books sold in Canada on amazon. Save Your Mind, by Dr. Antoine Hakim, has been another long-term occupant of the highly-prized top-100 list on amazon in Canada. It’s also been the Number One bestseller in books about Alzheimer’s on amazon.ca too. The Gairdner award winning doctor’s book on preventing dementia has also made it onto the Book Manager National Bestseller List, which is the key independent database of book information that the vast majority of smaller retailers use. Congratulations to all of our bestselling Barlow authors!